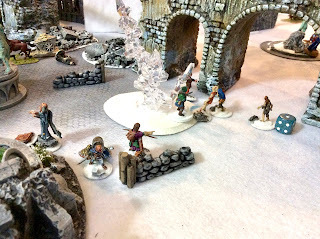 This past Saturday we got together to play the third game of our new 2017 Frostgrave Campaign. This year our goal is to play a game each month and work our way through the "Thaw of the Lich Lord" (TotLL) supplement book. 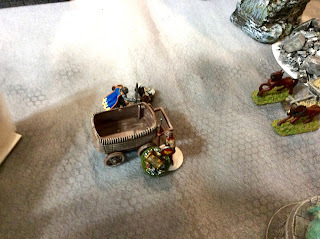 Last month we played the book's second scenario, (To read the account of last month's game see: Battle on the River), and this month we moved on to the third scenario, "Loot the Cart", or as we modified it, "Loot the Caravan". 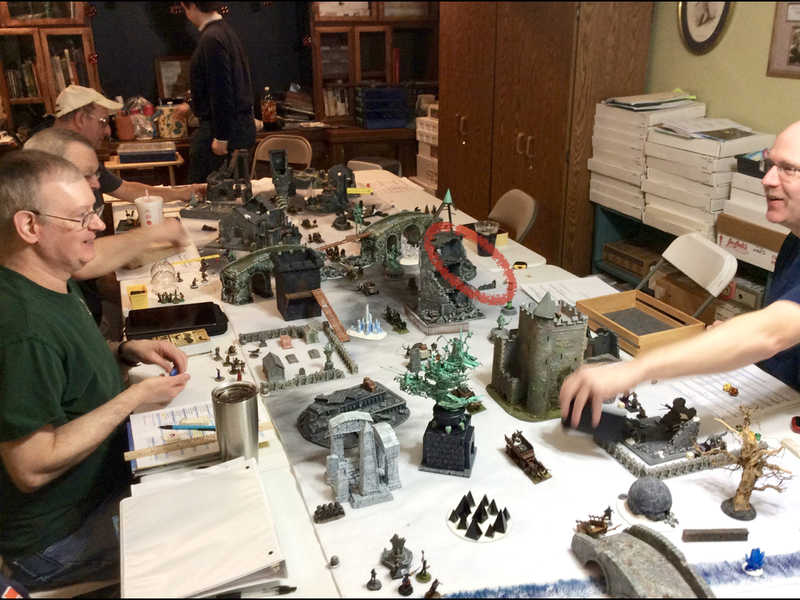 We had 6 of our 8 regular players, and one guest player, available for Saturday's game; so we used the full 12' x 3' table set-up. Since there were 7 of us, we increased the number of carts to 12, and then each took turns placing two of our treasures in the carts. We didn't make any rules as to which carts these treasures had to be placed, so technically players could have piled them all in one; but no one was willing to risk making a big pile of treasure, and then not getting to start in the area in which the overloaded cart was located. So we ended up with 10 of the carts containing one treasure, and two of the carts containing 2 treasures. We then placed one Death Cultist with each treasure, so most carts had one Cultist, and the double-treasure carts had a pair of Cultists. Next, we placed our third treasure as per the normal treasure placing rules. We determined that the entry locations for the Ghoul reinforcements that arrive on turn three would be determined randomly with a d30 dice roll, just like we do for wandering beasts; and there would be 14 of them (2 x 7 players). We then established our initial set-up positions and first turn order using our usual numbered-poker-chips-in-a-paper-bag method. My Sigilist, Quailelyn, and her Apprentice, Bailisette, with their party, started in the center of the side with three players, exactly where I didn't want her to be; as this meant that I had two warbands to my front, and one on each side. 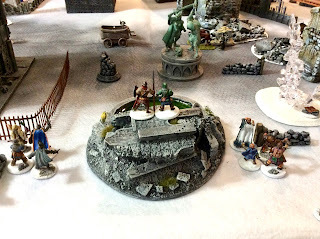 To my warband's left was the warband of a Summoner called Chaffarn to the left front was the Sigilist, Bemis. To the right front was Basil the Elementalist, and directly on their right was an unknown Soothsayer. 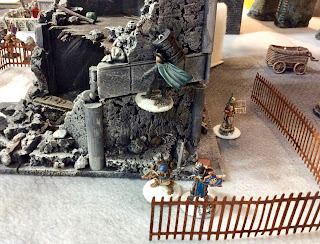 As Maga Librarian Quailelyn picked her way through the rubble, she became increasing aware of the presence of other wizards nearby in the city. 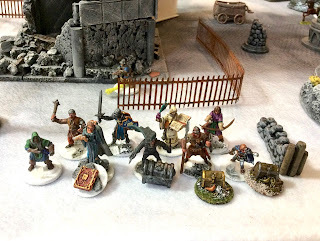 Apparently, they were not the only ones who had heard the rumors of the upstart Necromancer now residing in Frostgrave and his caravan of supplies and treasure that was currently stuck in the city due to several of the wagons breaking down in the rubble and ice filled streets. She turned to her Apprentice, Bailisette, and said, "Can you feel them? The other wizards?" The young girl concentrated a moment and then nodded. Quail had been up early this morning, and she and Bailey had stood out on the parapet of her tower base with the old magical Felstad Atlas that the Maga Librarian had liberated from her university library's Antiquities section, and the magic crystal magnifier that was needed to read it. The pair stood in the frigid morning air, and attempted to discern a good place to look for treasure that day. It was up on this perch that Sir Cardidill the knight had found them, as he came huffing up the long staircase and burst through the tower door leading to the parapet; his breath huffing hard in the cold air. The two women turned in shock, as they were not used to being disturbed up on the tower's top floor; as few in the party fancied the long climb. Sir Cardidil opened his mouth as if preparing to speak, then bent over and putting his hands on his knees took a moment to catch his breath. 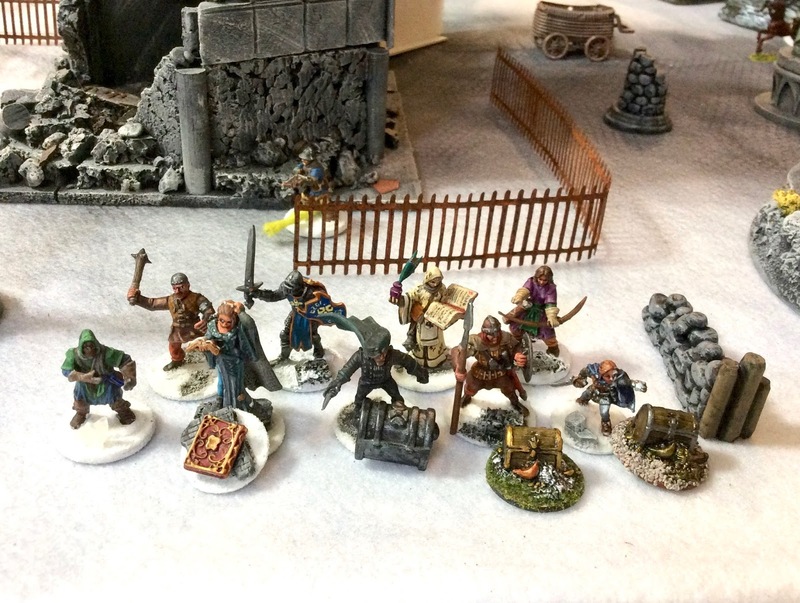 He rose again, and collecting himself, reported the news that he had heard that morning in the tavern where he had gone to break his fast: that there was a treasure caravan, belonging to an evil necromancer, stranded in the city on the Avenue of Eternals, by the old Outer Viaduct. Then it came to her, the old tales of the Ring of Life, a powerful magic ring that gave the wearer protection from the undead; rumored to be hidden near a ring shaped pool of water. The name was so similar to the landmark, she wondered if it could be the same. If they were to be facing a Necromancer and his minions, it might not be a bad object to obtain. Perhaps they could locate the ruins of the fountain on their way to find the caravan. (Successful pre-game casting of Reveal Secret.) Quailelyn heaved the old book shut, and turned to Sir Cardidil. "Prepare the party. ", she commanded. She turned to Bailey, "See that spire of ice over there?" The Apprentice turned and looked. " You sometimes find those naturally occurring in frozen climes over the sites of powerful magic relics. Something to do with the magical energy they emit resonating with the ice crystals in the air. I bet if you search beneath the spire you will find the magic ring we seek. " 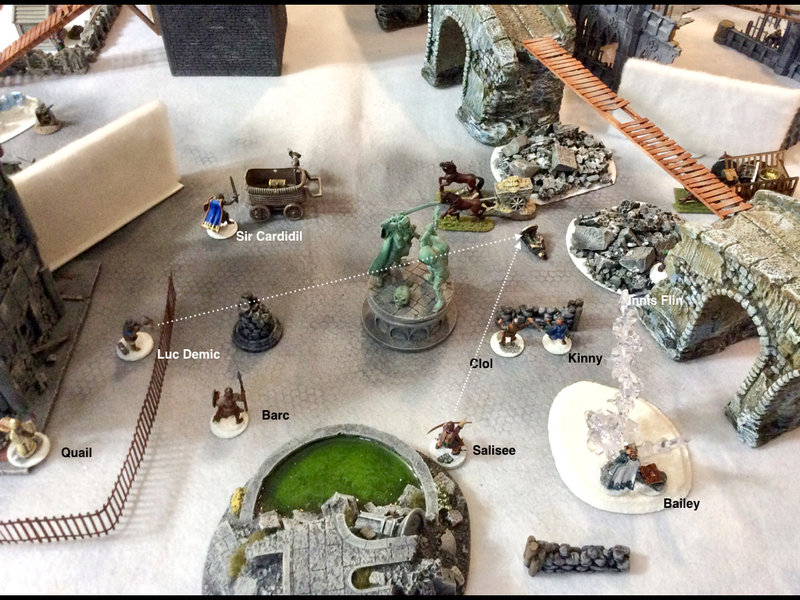 She then directed her Apprentice, Clol the Infantryman, Sallisee the Archer, and Kinny the Thief to go over and investigate the spire and then capture the cart to their front on the right. With herself she took Sir Cardidil the Knight, Luc Demic the Crossbowman, and Dorchesman the Treasure Hunter. She left Innis Flin the Thief, and Barc the Man-At-Arms to help out where needed. Quailelyn hadn't advanced far when she saw one of the Sigilist Bemis' calling cards appear in the sky: A Draining Word for Bone Dart. That's not a bad idea she thought, and she raised her hand and with a slender finger began tracing letters skyward, producing a Draining Word of Elemental Bolt. That will help, she thought. She then took a moment to survey the surrounding ruins, and found they were very boxed in by a large ruined tower on her left, and the old viaduct on her right, and she realized that might not be a bad thing as far as guarding from encroaching warbands on their flanks went. She was however very exposed to her front, so the wizard called to Bailey a single word, "Fog!" Obediently, the young girl began casting a Fog wall by the ruined tower on the left, and then she turned and produced a second Fog over on the far side of a gap in the viaduct. Meanwhile Bemis' Apprentice added a Draining Word: Leap, to the sky, which now burned with fiery glowing words in several spots, casting green and red glow on the taller ruins. Over on the right, Sallisee put an arrow in the Cultist by the cart to their right front, and before the wounded man could find a place to hide, Luc Demic finished him off with a crossbow bolt. On the left, Sir Cardidil and Barc made their way forward to the lefthand cart. The swirling snow intensified as Carffarn's Apprentice, Aina, added her own Call Storm spell to the squall. Barc and Sir C engaged with the Cultist guarding the second cart, and brought him down; but not before he gave the Man-at-Arms a nasty wound. The Knight quickly rummaged through the cart and found a promising chest. He looked up and could see the blood dripping down Barc's left pants leg, and the gash in his leather jerkin. "Can you take this and get back to the tower?" he asked the wounded soldier? Barc nodded sternly and clutching the chest with one hand and his side with the other, began dragging the prize back through the snow. Over at the other cart, the small Thief, Kinny, was hefting a large chest, almost as big as her, out of the back; then letting it drop out onto the ground, she hopped down beside it, and with a strength above what one would expect from her size, she began dragging it through the snow. 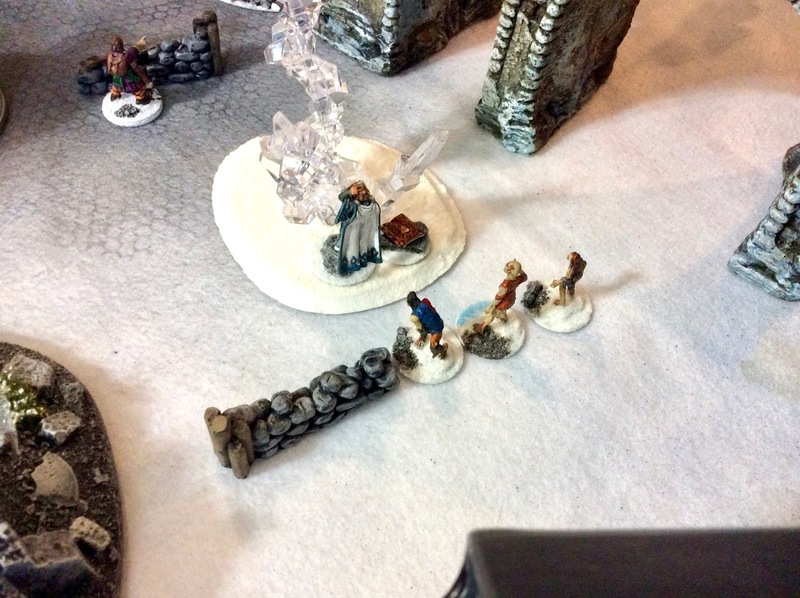 Quail's eyes were caught by some movement behind them , and she turned to see a trio of Zombies shuffling through the storm towards Bailey; who was herself busy searching beneath the ice spire for the ring. The snow was surprisingly fluffy despite the weight of ice on top of it, and she didn't have to dig far before she found a strange large flat box. She snapped the clasp open and there in a large expanse of blue satin, was a small circular indentation holding a gold ring. Snapping the lid closed again, she looked up, startled at Quail's call, and stumbled backwards at the three gruesome figures making their way towards her. She called for help as she ran from the threat, clutching the oversized ring box. The Maga Librarian peered through the swirling storm (Now intensified to a third level) to try and see what was happening to her Apprentice. Nearby, Luc Demic called out, "Watch out Ma'am!" as he raised his crossbow to fire at her. Quickly she realized it wasn't her he was aiming at, but instead it was a Large Rat, nearly the size of a big dog, that had crawled out of a pile of nearby rubble and was almost upon her. She had been so distracted by the Zombies falling upon Bailey she hadn't even noticed it. Luckily, despite the raging weather, Luc's shot was true, and the rat dropped dead, just a little over a foot from the Sigilist. Bailisette's cries for help, did not go unheeded, and Sallisee, Innis Flin and Clol were soon there to help. Sallisee fired a couple arrows, but with the raging storm her shots were ineffective. It was up to Innis and Clol to take care of the undead intruders. Clol gave one a might blow with his new Club of Battering, severely wounding it and sending it reeling back 3 inches. The other two Zombies attacked Innis, and while the Thief was able to fend of one without doing any damage, the second gave him a nasty slice across the arm with its long filthy claw-like fingernails. Clol, came to help his friend, and with the help of the magic club the pair made short work of the other two, and then finished off the third. Quail found herself facing another problem as Ghouls sent by the Necromancer to help the Cultists guarding the caravan, now appeared near where she stood. She had wandered a little away from the group, searching for any likely spots to which she could teleport to search for treasure, and now she was alone facing two Ghouls. Quickly she pulled a quill from her pouch, and rubbing the tip between her two hands, she spoke the words of Furious Quill, and tossed the feather into the air. It immediately shot through the storm and began stabbing at the head of one of the Ghouls like an angry bird. The Ghoul swatted at it confusedly, but wasn't quick enough to catch it. "Bailey! Some help, please! ", she called out to her Apprentice, "Now!" Bailey was too far away to be much immediate help, but she could see what an unfortunate position her master was in. Quickly raising one hand as if she was trying to hold up a wall, the young girl chanted the words of a Push spell with all her concentration and might. 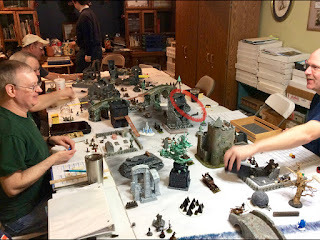 It hit one of the Ghouls with such force it sent him flying backwards (Rolled an 18 attack + 10) where only it's hitting the wall of a distant ruin, with a loud thud, stopped it. Quail caught her breath and analyzed the situation. As the Maga Librarian tried to come up with a plan, she was shocked when she suddenly heard whistling coming from above her, drifting down with the swirling flakes; and turning to look up she saw Dorchesman, the Treasure Hunter, scaling down the ruined tower wall. He had a big chest strapped to his back, and a happy tune was coming from his pursed lips. He stopped whistling long enough to call down, "Wait until you see what I have, Ma'am! ", and he resumed his merry song. Quail tried to place the tune, and thought it sounded similar to a bawdy one she had heard once or twice at the university when students thought she was out of earshot. But surely not here, now, from Dorchesman, she thought. She didn't think about it long, as her attention was quickly drawn back to the matters at hand. She had four treasures and no one had fallen so far during the foray. It was definitely time to call it a day she thought. She called to the Knight, " Sir Cardidil, can you safely buy us some time?!" "Yes, Ma'am. It would be my pleasure!" the Knight responded, and raising his sword he advanced towards the Ghouls. The rest of the party began the trek back to the tower. Sir Cardidil arrived back at the tower about an half hour after the rest, a bad gash in one shoulder; but none the worse for wear. Quail couldn't believe her good fortune: four treasures recovered, and no one killed, nor even that badly wounded. She could get used to this kind of outcome, but knew she was just experiencing a run of good luck. The Sigilist was always weary of good fortune as she knew there was only one way it could turn. Quail had never seen so much gold at one time in her life. It was more wealth than she made in a year at the university. She would have to do some careful thinking about how to spend it, and certainly some of the party had earned promotions. But for the moment she found her thoughts turning to the Necromancer who's caravan they had raided. There was a great deal of power and planning behind an effort so large, and supplies of such quantity belied a large operation. Something was afoot in the city, and it troubled the Maga Librarian. Epilogue: It was a really fun game! 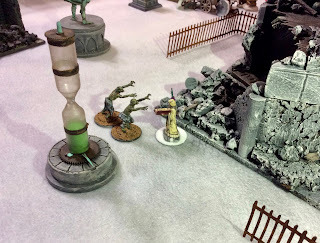 Despite my initial trepidation about where I was starting, terrain and situation conspired to draw everyone's attention away from Quail and her band; and I decided not to go looking for trouble, especially when I started getting a lot of monsters appearing in my zone. There was a double treasure cart just to my front left and the other to my front right, but I would have to have taken on the bulk of Bemis' and Basil's warbands to get them. 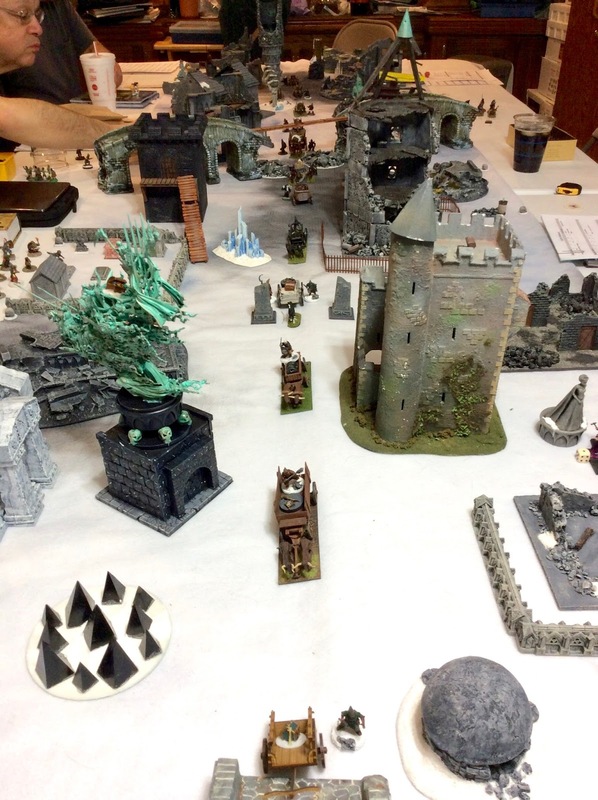 And the memory of battling two warbands was too fresh in my mind from the last game. I saw no reason to risk it, especially when there was more than enough treasure within my easy reach. It was another game where nobody died, which worries me as much as it pleases me. Having just played a year with Kodak, who lost key figures almost every game, I'm not use to this, and I know the game is going to come soon where I'm hit hard. Quail hasn't had to face the realities of loosing a member of her band yet, and that may be a hard wake-up call when it happens. For Bemis' report on the game, see: Wagons, Ho! Thanks, JP! I'll be interested to see your write-up!